Huawei P30 Pro and Huawei P30 smartphones are official. After months of leaks and rumours, Huawei on Tuesday unveiled its latest smartphones at the P Series launch event in Paris. The Chinese telecommunications giant says that Huawei P30 and Huawei P30 Pro are its “most advanced camera smartphones to date,” and come with the company’s SuperSpectrum sensor, an optical zoom lens, and a new time-of-flight (ToF) camera. The new Huawei P30 Pro and P30 are going on sale today in select markets. Alongside the new smartphones, Huawei brought the FreeLace and FreeBuds Lite earbuds as well as Watch GT Elegant, Watch GT Active, and a 12,000mAh power bank. According to Huawei, the P30 will carry a starting price tag of EUR 799 (roughly Rs. 62,200), whereas the P30 Pro will retail starting EUR 999 (roughly Rs. 77,800) for the 8GB RAM/ 128GB storage model. The 8GB RAM/ 256GB storage variant of the Huawei P30 Pro comes at EUR 1099 (roughly Rs. 85,600) and EUR 1,249 (roughly Rs. 97,300) for the 8GB RAM/ 512GB storage option. The Huawei P30 and P30 Pro will be released in Black, and four new gradient finishes — Amber Sunrise, Aurora, Breathing Crystal, and Pearl White. As we mentioned earlier, both the Huawei P30 and P30 Pro are immediately going on sale in select markets. The Huawei P30 and P30 Pro run on Android 9 Pie with the company’s EMUI 9.1 on top. Packing dual-SIM and dual VoLTE connectivity, both P30 and P30 Pro sport almost bezel-less front with dewdrop notches. The Huawei P30 Pro features a 6.47-inch full-HD+ (1080×2340 pixels) OLED screen with 19.5:9 aspect ratio, whereas the P30 comes with 6.1-inch full-HD+ (1080×2340 pixels) OLED display with 19.5:9 aspect ratio. Underneath the display panels, Huawei has included in-display fingerprint sensors. Also, the P30 Pro screen comes with an Acoustic Display Technology that uses an in-screen maglev speaker to turn the display itself into a speaker like LG’s G8 ThinQ smartphone. The Huawei P30 and P30 Pro are powered by 7nm manufacturing process-based octa-core Kirin 980 SoC with Mali-G76 GPU. In addition to eight CPU cores, the Kirin 980 also packs two neural processing units (NPUs) to help in machine learning tasks, including faster image recognition. Further, the Huawei P30 features 6GB of RAM, 128GB of onboard storage while the P30 Pro includes 8GB of RAM, and a choice of 128GB/ 256GB/ 512GB of onboard storage. The Huawei P30 Pro also has wireless charging support and comes with a reverse wireless charging technology. Both phones also support Huawei’s 40W super charge technology. Huawei says it has also added a graphene film cooling system to manage the heat on both smartphones. 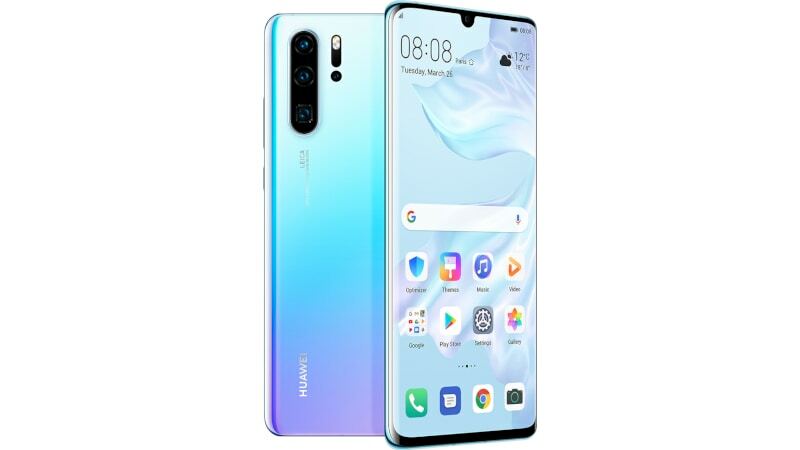 In terms of the imaging capabilities, Huawei has added a quad-camera setup on the P30 Pro, which houses a 40-megapixel primary camera with 1/1.7-inch Huawei SuperSpectrum Sensor and f/1.6 (27mm) lens, a 20-megapixel ultra-wide-angle secondary camera with an f/2.2 (16mm) lens, an 8-megapixel telephoto camera with an f/3.4 (125mm) lens, and a Time-of-Flight (TOF) camera. There is also dual OIS (optical image stabilisation). You also get Colour Temperature and Flicker sensor. The camera setup enables 5x optical, 10x hybrid, and 50x digital zoom. The Huawei P30, on the other hand, is missing the ToF camera and instead has a 40-megapixel ultra-wide-angle sensor along with an f/1.8 (27mm) lens. There is also a 16-megapixel ultra-wide-angle secondary camera with an f/2.2 (17mm) lens and an 8-megapixel sensor along with a telephoto lens (80mm) featuring an f/2.4 aperture. The Huawei P30 Laser Transmitter and Laser Receiver for an enhanced focus and an LED flash. The presence of the SuperSpectrum Sensor on both the Huawei P30 and P30 Pro enables maximum ISO rating of 204,800 and 409,600, respectively, accord to the company. For selfies, the Huawei P30 and P30 Pro both feature a 32-megapixel front shooter with an f/2.0 lens. The phones also have AI HDR+ to optimise overexposed and backlit selfies. Huawei is also offerings a Super Portrait Mode that combines depth information, 4-in-1 pixel binning and proprietary algorithms to enhance image results. Furthermore, there are features such as Portrait Against Backlight and AIS (Artificial Intelligence Stablisation). On the videography front, the Huawei P30 phones come with a Dual-View Video mode that is designed to record wide-angle and closeup view simultaneously. Huawei also revealed the DxOMark scores of the Huawei P30 Pro. The company claims that while the phone received an overall score of 112, its video performance got 97 scores and photography achieved 119 scores. Aside from the P30 and P30 Pro smartphones, Huawei at its event brought the FreeLace earbuds with a “plug to pair and charge” design. The earbuds are claimed to deliver four hours of playback with just five minutes of charge and are designed to provide 18 hours of continuous playback. Huawei also unveiled the FreeBuds earbuds with a design similar to Apple’s AirPods These earbuds come with 12 hours of battery life through their available case and have an IPX4-rated water and dust resistant build.